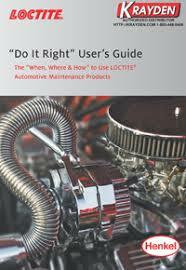 Henkel has been making LOCTITE® automotive maintenance and repair products for more than fifty years! These are the same products specified by automotive manufacturers and used in race cars. Reliability has been in their roots since the invention of the threadlocking adhesive. We're here to help you do the job right the first time, every time.